(APN) ATLANTA — A pro-consumer bill, HB 931, co-sponsored by State Rep. Karla Drenner (D-Avondale), calls for an end to the Nuclear Construction Cost Recovery (NCCR) surcharge on Georgia Power electric bills after March 2017. Ratepayers have already paid over one billion dollars through the NCCR tariff on their utility bills for this project. The money collected from the NCCR tariff not only pays for the construction financing costs, but one-half of that amount goes to Georgia Power’s profits and another one-fourth goes to pay the income tax on their profit, according to Georgia Watch, a consumer advocacy group. In 2009, the legislature passed the anti-consumer SB 31, the Georgia Nuclear Energy Financing Act, that allowed Georgia Power to charge captive ratepayers the NCCR tariff, to pay in advance for construction of Vogtle 3 and 4. There was no provision in SB 31 to protect the consumer from expensive delays in construction or exceeding the 6.1 billion dollar budget to build the plants. The latest estimate today to finish the job is over $21 billion and rising with a revised completion date of 2020 or later. 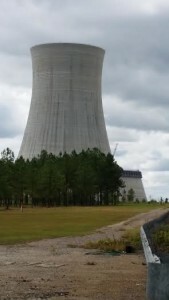 “HB 931 would protect current Georgia Power customers from bearing most of the burden of Vogtle cost overruns,” Liz Coyle, Executive Director, Georgia Watch, said in a press release. If the tariff is extended past March 2017, ratepayers will pay billions more for cost overruns, construction delay, and bad management. “We have a moral obligation to reel this in. If this was a private company’s money and not the ratepayers money, would it be managed differently,” Rep. Drenner said at a Georgia Watch Legislative Breakfast meeting. Public Service Commissioner Lauren “Bubba” McDonald (District 4) voted for CWIP (Construction Work In Progress or NCCR) back in 2009, and said he also voted for the timeline to expire in March 2017. Commissioner McDonald said he does not support extending the surcharge past that deadline. “I’m building trust with the people that I represent back then. I said I’m going to do this (vote for CWIP/NCCR) and you are going to pay now but it’s going to go away soon,” in March 2017, McDonald said at a PSC energy meeting. “I’m still for the project, but if die between now and 2017… I’m not going to be the beneficiary of that energy,” McDonald said. Other co-sponsors of the bill are State Reps. Pam Stephenson (D-Decatur) and Howard Mosby (D-Atlanta). It has been assigned to the House Committee on Energy, Utilities and Telecommunications.